•Existing literature places the TPJ at the interface between mind and matter. •The right TPJ is critical for the control of self and other representations. •Dysfunction of right TPJ may therefore compromise our sense of self. •Disintegration of the self may in turn underpin various neuropsychiatric symptoms. The temporo-parietal junction (TPJ) is implicated in a variety of processes including multisensory integration, social cognition, sense of agency and stimulus-driven attention functions. Furthermore, manipulation of cortical excitation in this region can influence a diverse range of personal and interpersonal perceptions, from those involved in moral decision making to judgments about the location of the self in space. Synthesis of existing studies places the TPJ at the neural interface between mind and matter, where information about both mental and physical states is processed and integrated, contributing to self-other differentiation. After first summarising the functions of the TPJ according to existing literature, this narrative review aims to offer insight into the potential role of TPJ dysfunction in neuropsychiatric disorders, with a focus on the involvement of the right TPJ in controlling representations relating to the self and other. Problems with self-other distinctions may reflect or pose a vulnerability to the symptoms associated with Tourette syndrome, Schizophrenia, Autistic Spectrum Disorder and Obsessive Compulsive Disorder. Further study of this most fascinating neural region will therefore make a substantial contribution to our understanding of neuropsychiatric symptomatology and highlight significant opportunities for therapeutic impact. Anatomical and functional subdivisions of the temporo-parietal junction. 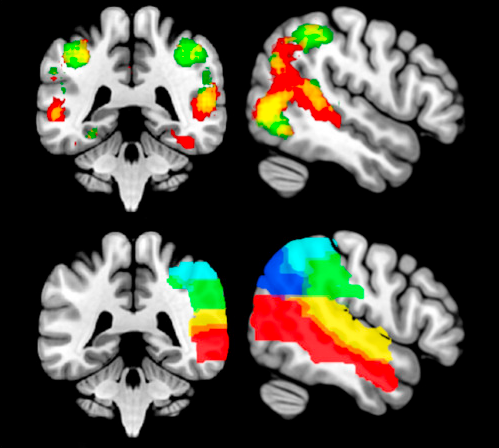 Top row: Functional MRI meta-analysis data...Showing forward inference data identified using the terms ‘social’ in red, and ‘attention’ in green, with overlap in yellow. Bottom row: Standard anatomical maps using Automated Anatomical Labelling. Showing right inferior parietal lobe (cyan), supramarginal gyrus (green), angular gyrus (deep blue), superior temporal gyrus (yellow) and middle temporal gyrus (red).